I realize this blog has turned into the daily card show - I am looking forward to getting back and mixing it up a bit more. I have actually started a few drafts here and there, and I have started blogging in my head (which I guess is the modern-day equivalent of thinking thoughts that you might write in your diary later?) Feeling the itch to blog even when I've signed off from an "editorial calendar" has been a good self-check that this is something I want to be doing - it feels enjoyable and organic. This was a weird week - I had just about eight days in DC between Mauritania/Texas and Guatemala/Belize/Mexico. So I felt a bit discombobulated and "in between." I had the full use of my crafting supplies but almost preferred to stick with the limited stash in my travel kit since I still felt very much in travel mode. 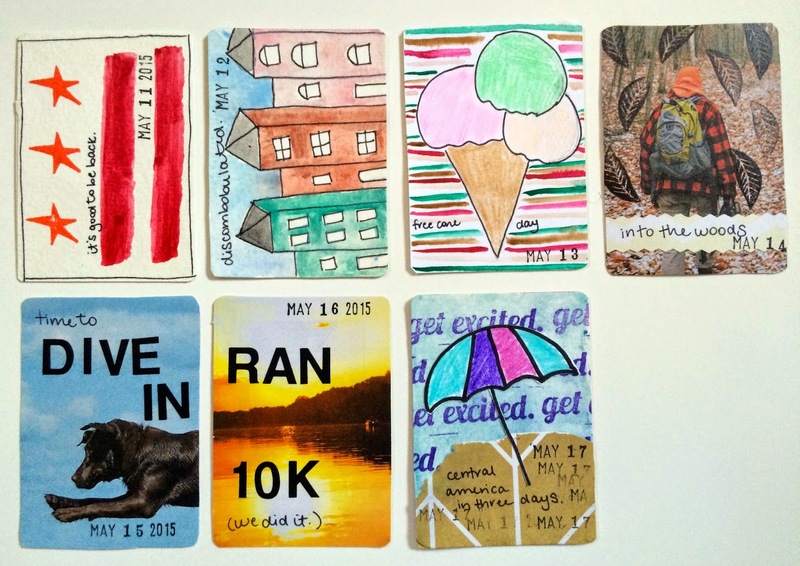 Favorites this week are the cards for May 15 and May 16 when, in the middle of my short week at home, I headed out to Maryland's Eastern Shore to run my first 10k with my friends. In keeping with the location, the background images are from a calendar put out by the Chesapeake Bay Maritime Museum. I love how they capture the before-the-race feeling of taking a big leap and the peace and satisfaction that followed. When this goes live, thanks to the wonders of technology, I will be fifteen minutes into the plane ride to Guatemala City. Woohoo! I had a good desk to spread out on when I was staying in Mauritania, but the next couple weeks of cards will be coming from the assorted hostels of Central America so I am expecting things to stay pretty basic around here. This week's cards capture a couple of my favorite Mauritanian patterns - the red and blue plus-sign pattern is one that pops up on tents, clothing, and gift bags, and the green and yellow is from the curtains in the guest apartment at the office. I'm back in DC after an exciting, productive, HOT trip to Mauritania and a wonderful weekend in Texas with my family (especially my amazing aunt :). 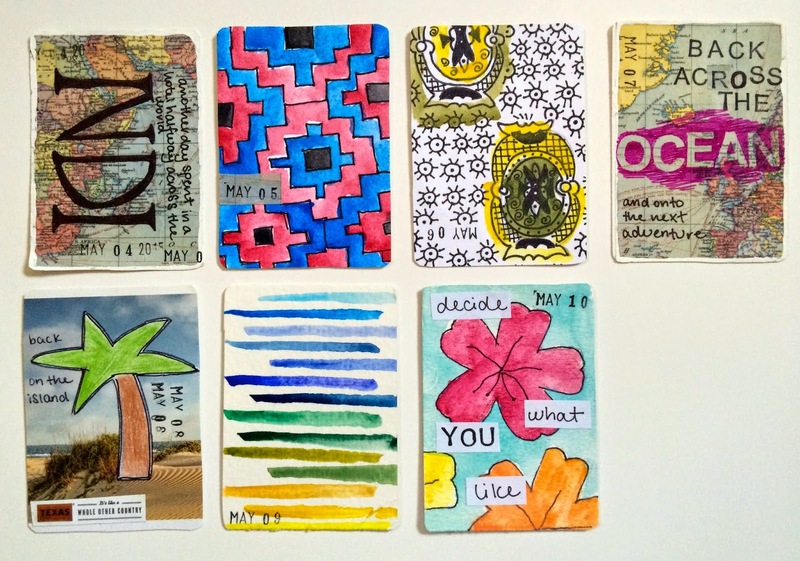 And the time has come to share the cards I made during my travels. I pre-decorated two weeks of cards with map gift bags from Paper Source, and they made a great jumping-off point after long workdays with limited materials. 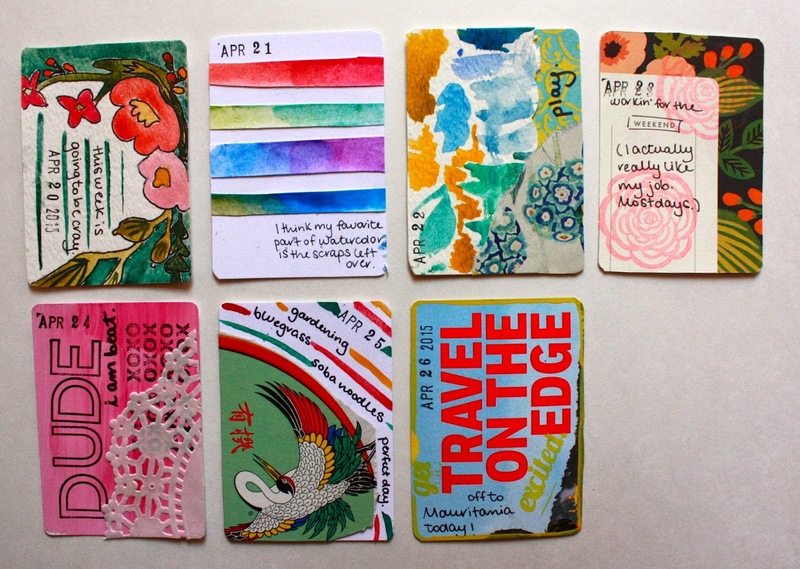 I pretty much just used those and some watercolors and stamps for everything this week. Eventually the maps got a bit boring - and I'll be leaning on them again when I leave for Central America next week - so I branched out a bit and tried to recreate some Mauritanian fabric patterns with watercolor. (May 3 was inspired by this one and there are more to share in the next batch). 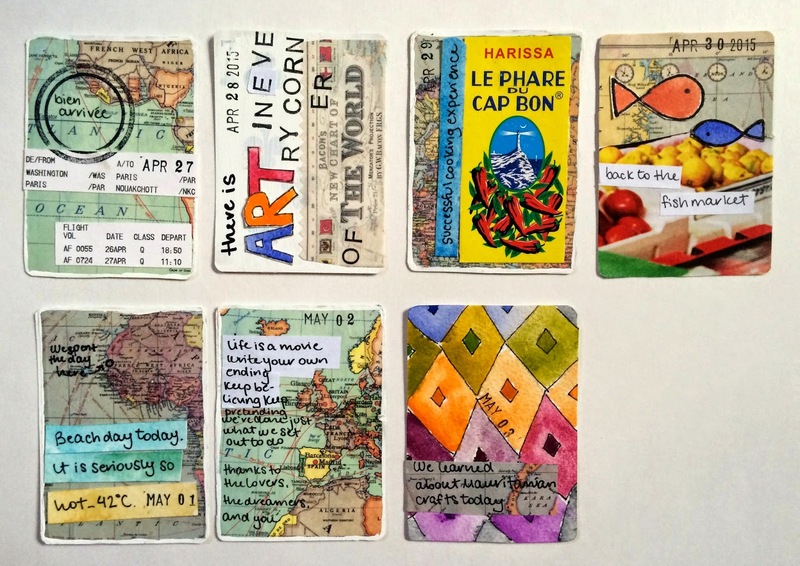 I loved that idea and will definitely incorporate that into my card-making and art-journaling during future travels - I think it's a great way to capture the look and feel of a place. Anyone who has embarked on a year-long project will probably not be surprised to hear that I fall in and out of love with this one on the regular. 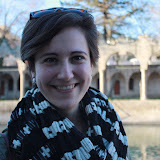 There was an initial honeymoon period for sure, but some weeks have felt like a drag. This was not one of them. On the best days, it's fun to start daydreaming in the evenings about what I can put on a card that will capture a thought or experience from the day and be at least a little interesting technique-wise. I think the key towards having fun with something like this is not overthinking it - not everything has to be hugely innovative because that would just get exhausting. This week I really enjoyed playing with scraps of watercolor and riffing on Rifle Paper Co designs. Next week I'll post the first batch of bringing-the-show-to-Mauritania cards!